DENVER – Few NHL players have been blessed with the combination of power, strength, physical prowess and finesse that enabled Peter Forsberg to dominate games during a star-studded 14-season career, a dozen of them with the Quebec Nordiques/Colorado Avalanche franchise. "He obviously had a very high level of skill, but I think it's the physical part of the game that he brought to the ice that made him different than your typical skill players," former Avalanche teammate Claude Lemieux said Saturday. "Aside from being a spectacular player, that's what separated him from so many great players. He was great and he also was tough and physical and a pain to play against." A native of Ornskoldsvik, Sweden, Forsberg played a huge role in the Avalanche's Stanley Cup championship teams of 1996 and 2001, and he remains a beloved figure in Denver. On Saturday night, the Avalanche retired the former star center's No. 21 jersey at the sold-out Pepsi Center before its season opener against Detroit. The Red Wings were a fitting opponent considering Forsberg's involvement during the teams' once bitter and often bloody rivalry. Forsberg, now 38, was joined by his parents Kent and Gutrun, his brother Roger and fiancée Nicole as they watched his sweater hoisted to the rafters, joining those of Ray Bourque (No. 77), Patrick Roy (No. 33) and Joe Sakic (No. 19). Forsberg entered the arena to a thunderous ovation. He shook hands with fans as he made his way down stairs in the lower bowl, and he waved to the crowd while walking on a red carpet along the ice. "I am overwhelmed, I am proud and I will never forget this high honor," Forsberg said at center ice after being introduced by team president Pierre Lacroix. His speech was interrupted several times by applauding fans who stood and chanted "Pe-ter … Pe-ter." Forsberg, who said in a news conference that he and Nicole have not yet set a wedding date, earlier told the arena crowd that he would keep his Denver apartment and that if the couple has a boy, "he will wear" the Avalanche's blue and burgundy colors. That remark drew a rousing ovation from the crowd, as did this statement: "Another highlight (of his career) was always beating the Red Wings." All current Avalanche players wore No. 21 jerseys while sitting on the bench during the ceremony and in the pregame warmup. The jerseys will be signed by each player and by Forsberg, and are available at auctions.nhl.com through Oct. 21 with proceeds benefitting Kroenke Sports Charities. 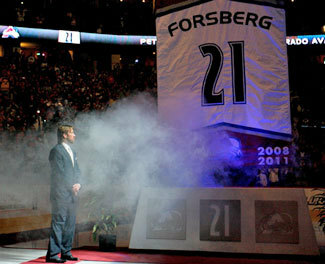 Highlights of Forsberg's career were shown on five video boards, and his digits were displayed on the boards surrounding the rink and on the ice behind both nets. "I was standing up there watching the highlights, felt emotional," he said later. "I was walking to the ice, it was great. It feels great to have it done with. Today was unbelievable. I will forever remember this." Forsberg said he still doesn't understand why he became so popular in Colorado, despite his extraordinary accomplishments on the ice. "When I look at my highlights, when I watch how I played, I was involved," he said. "I was running people, I was wrestling. I was opening up spots for everybody else on the ice. Maybe that's what the fans saw too. It was not like I was going out there and coming off the ice and not sweating. I didn’t enjoy losing. That’s what I'm hoping people remember." Forsberg collected 217 goals and 755 points in 591 games with Quebec and Colorado, making him the fourth-highest scorer in franchise history. He also played briefly with Philadelphia and Nashville, and finished with 249 goals and 885 points in 708 career games. He ranks second in Nordiques/Avalanche franchise playoff history with 159 points (58 goals, 101 assists) in 140 games. Forsberg has a trophy case full of hardware that includes the 1995 Calder Trophy with Quebec, along with the Art Ross Trophy and Hart Trophy he won in 2003 with Colorado. He was selected to seven NHL All-Star Games, three times earned NHL First All-Star team honors, and he won two Olympic gold medals and as many World Championships with Sweden. Injuries took a serious toll on Forsberg, who needed surgery to remove his spleen following a hotly-contested seven-game, second-round playoff series with Los Angeles in 2001. A chronic right foot ailment caused him problems throughout much of his career and forced him to end an attempted comeback after two games last February following a two-year layoff from NHL games. "(Forsberg's physical style) definitely took a toll on his career," Lemieux said. "He might have played more games if he didn't play that way, but that's how he wanted to play. You can't take that fire out of a player. "Peter was a very emotional player. He was a guy who brought the team up with a big hit or mixing it up with somebody in Detroit or whatever. That was Peter. I remember when I got here, my wife used to blame me for Peter's play. She thought that was rubbing off in a negative way on him. I said, 'No, I've seen this kid play before. He likes it this way.' And I'd say to him, 'You don’t have to be that physical. Let me do that stuff.' He said, 'No, I have to be involved in the game.' "
Forsberg is taking that competitive fire in another direction, managing his former Modo team in Sweden with good friend and former NHL star Markus Naslund. He has several business ventures and is attending economic classes with Nicole. "I really enjoy my life," he said. "It's been tough the last couple of years, but right now it's great. I can't say anything negative about my life. I go back to Sweden and even though it's cold and dark, I still enjoy being back there." Milan Hejduk, the lone active Avalanche player remaining from the 2001 Cup team, said it was a privilege to play with Forsberg. "I would have gone and bought a ticket to watch him," Hejduk said. "You never knew what he was going to do. He was something special. He had a signature move where he skated behind the net with the puck, hit the 'D' and kept the puck, stuff like that. I was fortunate enough to play with him for a number of years. It was really fun to play with him. I would always try to find an open space and he would put the puck through 15 skates and sticks, and it would always land on your stick." Avalanche rookie Gabriel Landeskog, 18, is from Stockholm and idolized Forsberg while growing up. He spoke with Forsberg on the phone the day after being selected second overall in the NHL entry draft last June and was eager to meet him for the first time Saturday. "He's just a very nice guy, very humble, very down to earth as well," Landeskog said. "He meant a lot for the game back home. To me, personally, just the way he could dominate the game physically but also with his skill. His will to win was tremendous."